How Will NASA's New Horizons Mission to Pluto Be Remembered? This photo featuring Pluto's "heart" was captured by NASA's New Horizons probe in July 2015. NASA's New Horizons Pluto mission should leave a rich scientific legacy, and could help spur future ambitious exploration efforts throughout the solar system, researchers say. New Horizons conducted the first-ever Pluto flyby on July 14, collecting reams of images and data about the dwarf planet and its five moons. New Horizons becomes the first probe to explore Pluto in mid-2015. See how the New Horizons mission to Pluto works in our full infographic here. 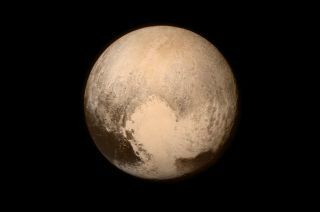 The enormous public interest in the Pluto flyby also demonstrates that people love space exploration, especially missions that do new things or study little-known worlds or realms, New Horizons principal investigator (PI) Alan Stern told Space.com. "I hope that New Horizons and Pluto have become an accelerant to space exploration," said Stern, who's based at the Southwest Research Institute in Boulder, Colorado. "Here's a mission run by an individual PI — small team, five times less money than [NASA's] Voyager [program] — and we lit the world on fire," Stern added. (New Horizons' total cost is about $720 million.) "What if you did human exploration in a way that lit people on fire on a 100-times bigger scale? It would be Earth-shattering." American astronomer Clyde Tombaugh discovered Pluto in 1930. For a long time thereafter, the frigid world was regarded as an oddball. After all, it was the Kuiper Belt's lone known resident. "I am most excited about this whole mission as sort of our only chance to get a view of what a Kuiper Belt object looks like — or two of them, two different-sized ones — and to sort of get an impression," said Mike Brown, a planetary astronomer at the California Institute of Technology in Pasadena who led the team that discovered Eris (and many other objects beyond Neptune, including Sedna). Those pictures of Pluto and its moons have surprised most planetary scientists. The photos depict ice mountains and glaciers on Pluto and large, deep canyons on Charon, the dwarf planet's largest satellite. Some of the Pluto and Charon terrain imaged by New Horizons features few or no craters, suggesting that both worlds have been geologically active in the very recent past. "That's an eye-opener," Sheppard told Space.com, explaining that many scientists had thought Pluto and other KBOs have probably been "dead" internally for eons, lacking the energy source required to sustain geological activity. New Horizons' imagery "is really making us have to go back to the drawing board to try to figure out what could be creating all of this activity," Sheppard said. The mechanism must be different from that of other icy active worlds such as Saturn's moon Enceladus and the Jupiter satellite Europa, which are tugged hard by their giant parent planets, researchers say. "Somehow the engine in Pluto is still running after four billion years, and nobody I know in the geophysics world knows how to make that happen," Stern said. It's worth noting, however, that Brown is not convinced that Pluto has been active in the recent past. There is no evidence of recent mountain-building, and the dwarf planet's flowing ices don't require an internal energy source, he said. Furthermore, Pluto's atmosphere and its icy plains are made of the same stuff, Brown said; when surface ices sublime, they go up into the atmosphere. All of this discussion and debate is based on a tiny fraction of New Horizons' dataset. The probe won't finish beaming home all of its flyby images and measurements until late 2016, Stern has said. Whichever small KBO is chosen likely formed close to its present position, whereas Pluto probably coalesced near the giant-planet region and was booted out to the Kuiper Belt, Sheppard said. Furthermore, he added, smaller KBOs are more pristine and primitive than Pluto and therefore provide a better glimpse at the raw materials that built the planets 4.5 billion years ago. "The true mission is only half over," Sheppard said of New Horizons. "Linking the materials that we find in the Pluto system to these much smaller objects is going to really open our eyes to what the planets are made of." "I'm told that we created the biggest bang for exploration in anybody's memory," perhaps going all the way back to NASA's Apollo moon missions, Stern said. Such intense global interest and excitement bodes well for future exploration efforts — both robotic and human — that aim to do new things, he added. Stern hopes the enthusiasm and the lessons learned from it could make possible a Charon lander, which would study both that world and nearby Pluto from orbit. But a return to the Pluto system "should be in parallel with [rather than substitute for] more exploration," Stern said, citing a manned journey to Mars as another desirable project. For his part, Brown would love to get up-close looks at other distant bodies, especially Quaoar, a KBO about half the size of Pluto that he and Trujillo discovered in 2002. Quaoar represents a sort of transition point between Pluto and Charon, possessing some characteristics of both worlds, Brown said. But Brown isn't optimistic that a mission to Quaoar — which lies even farther from Earth than Pluto does — will launch anytime soon. "We just don't have the resources to visit all the interesting places in the solar system, and these at the edge of the solar system are just the hardest to get to," Brown said. "So I have resigned myself to never seeing any of these things that I discovered up close in my life. I suspect that's a reasonable prediction."